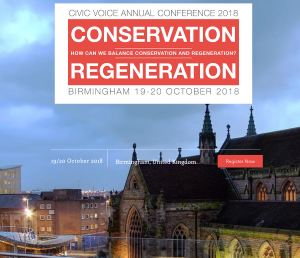 The IHBC is delighted to join in supporting the 2018 Civic Voice conference – which asks ‘how can we balance conservation and regeneration’ – and will host a stand for delegates across both days of the conference in Birmingham on 19-20 October. Tickets have been selling well for the Civic Voice Conference which is being held at The Rep Theatre, Birmingham on 19-20 October 2018. The Civic Voice team are working closely with Birmingham Civic Society in making sure this is a conference that makes a real difference – we don’t want you or your civic society to miss out – so book your place now and join groups including Blackpool, Bristol, Cockermouth and Retford who have already registered to attend. It will build upon our Big Conservation Conversation as we make the case for the importance of conservation areas and the historic environment. On the first day we will hear from a number of keynote speakers giving their perspective on national issues and what this could mean locally in our communities. Throughout the day you will have the opportunity to debate and engage with the keynote speakers and other delegates. On the second day, we will hold our AGM and this will then be followed by a number of workshops and opportunities for discussion and networking. This will give us all the opportunity to explore subjects and issues affecting the civic movement across the country in detail and hear from recent case studies. There will be be a number of tours and visits hosted by Birmingham Civic Society, giving you the chance to see and hear first-hand from the Society as they celebrate their centenary year. The workshops and tours are currently being finalised and will be announced at the end of August. If there are any particular subjects or issues that your civic society would be interested in discussing – please get in touch! The ticket price for the Conference includes lunch and refreshments for both days. Friday evening will be a night of entertainment and celebration in true ‘Brummie’ style. Tickets are available separately for the evening and include food and entertainment. Book your ticket for the Conference and Friday evening here. We are looking forward to seeing you in Birmingham in October! * More speakers and workshops to be confirmed in the next few weeks on our website here.